Lactose – 259.45 mg, sugar – 100.0 mg, potato starch – 50.0 mg, calcium carbonate – 50.0 mg, Vitamin C – 25.0 mg, calcium stearate – 15.0 mg, Vitamin D3 – 0.0028 mg, Vitamin B6 – 0.05 mg.
Calcium is a most important microelement, which is necessary for human body functioning, which is received with food. Calcium ions participate in blood clotting process, cell membranes permeability regulation, and neural impulses transmission; they take part in regulation of most various biochemical processes – hormones secretion, muscular contractions etc. Calcium is of vital importance for supporting health of the teeth and the bones. Calcium demand is age-dependent. Its daily value is 800-1000 mg for adults, and 600-900 mg for children due to active skeleton growth. About 90% of the total amount of calcium in the body is contained in the bones and the teeth. To cover the daily value of calcium it is necessary to consume food products, containing calcium, on a daily basis. Main sources of calcium for human body are dairy (cottage cheese, milk, cheeses), fish, soya products, beans, peanut, walnut, sunflower seeds, green vegetables (broccoli, celery, parsley, cabbage), garlic, radish. On the other hand, it should be noted that excess amount of fat, phytic acid (contained in corn and beans) hinder calcium uptake. Calcium deficiency in the pregnant may cause calcium wash-out from the bones and teeth of the future mother, what further results in problem with the teeth and premature osteoporosis development. 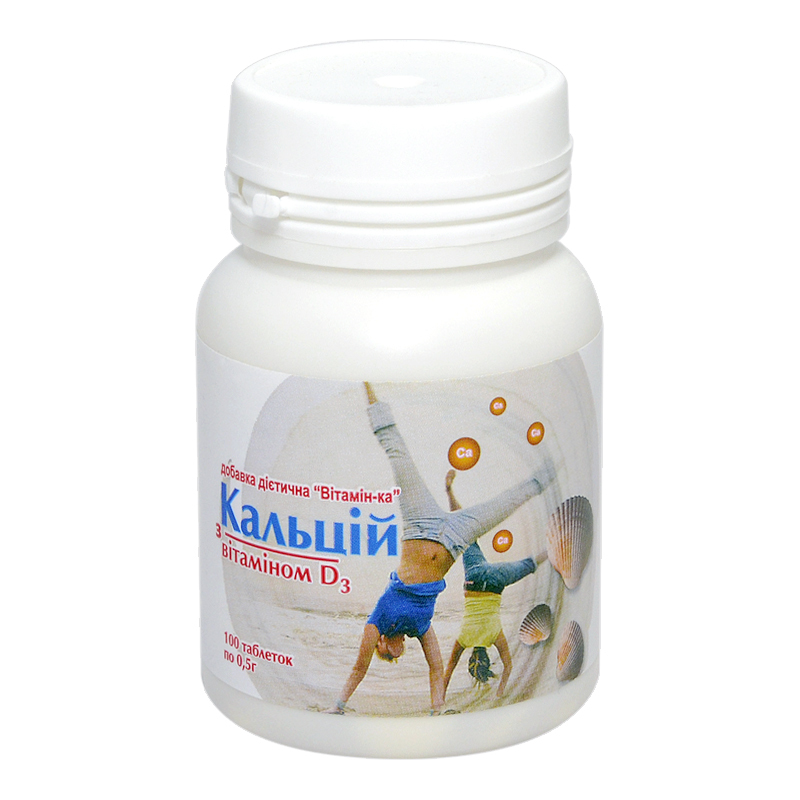 Availability of sufficient amount of vitamin D3, improving calcium absorption in the intestines and its fixation in the bone tissue, in the body is required for normal calcium uptake and elimination. In case of absence of the necessary amount of vitamin D3 only 8-10% of the consumed calcium is taken up. Sings of calcium deficiency are frequent fractures, muscular cramps (especially in the night), pains in joints and in the back, allergic reactions, fragile nails, poor state of teeth and nails. Adults and children since the age of 12 take 1-2 tablets thrice a day, children from 4 to 12 years take 1 tablet twice a day after meals. Term of use – 1 month. Repeat in 3 months’ break. Proteins – 0 g, carbohydrates – 7.81 g, fats – 1.8 g, vitamin C – 5 g, Vitamin D3 – 0.00056 g.